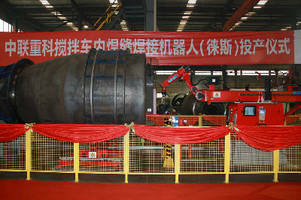 With a grand opening in October 2012, hand-over of the world-wide first robot welding system especially designed for internal seams in concrete mixing drums took place at Zoomlion Concrete Yuanjiang Industry Park in Hunan, China. Reis Robotics was involved as developer and manufacturer of the robot system. The new system was presented to the staff of Zoomlion and representatives of the press. Dr. Eberhard Kroth, Managing Director of the Reis Group Holding, and Dr. Manfred Emonts, Director of Reis Robotics Asia-Pacific, opened the ceremony together with Mr. Cheng Xiao Fei, Vice Director of Zoomlion and General Manager of the concrete department. The concrete mixing drum is a core part of the concrete mixer and makes high quality and precision demands to its welding seams. In order to fulfill the demands, Reis Robotics developed a special kinematics for this component. This consists of a linear axis with mounted articulated-arm robot and is especially designed for welding the seams in the hollow space inside the drum. Mr. Cheng Xiao Fei of Zoomlion emphasized the great productivity and quality progress achieved with this system. Additionally, he highlighted the excellent cooperation between the companies, Zoomlion and Reis, involved in the successful launching of this project. Reis Robotics is an innovative company leading in robot technology and system integration. The Reis Robotics group, with international activities, is headquartered in Obernburg, Germany and is a market leader for automation systems in the photovoltaic industry. For more than two decades, Reis has been one of the most important integrators for automation systems in all major industry sectors. In addition to articulated arm robots, the product range also includes linear robots, gantries, horizontal articulated arm robots, and other special robots. Additional products include Try-out and Spotting Presses as well as Trim Presses and Trim Tools. REIS ROBOTICS designs, delivers, and installs completely integrated automation systems from one source. Since 1957, our success is based on the great experience gained during the planning and execution of turnkey automation systems. For this, Reis Robotics offers a broad product range of industrial robots (welding robots, casting robots, handling robots, laser robots, and many others), peripheral modules and services for automation solutions in all major application fields.